Have you ever thought about what environmental impact your meetings or special events might have? Hundreds of invitations, plastic cups, utensils, plates, napkins, and food go in the trash during just one event. The impact from just one event, especially large gatherings, can be pretty significant. What if you could do it better? What if you could make it greener? Global warming aside, it just makes sense to reduce waste. It’s good for the world, and it can be good for your business. Now, that doesn’t mean if you hire us, you have to go green, but if you choose to do so, you’re in good hands. For specific suggestions on how to make your meeting or event green, call us at (404) 919-0426. Establish a green team to brainstorm ideas and practices to green your events. Establish detailed environmental policies and a strategy to implement them. Document and track successes, problems and failures of green event initiatives. Consistently communicate the policies in internal publications, event print material, and even at the podium. Work with or encourage your event venue to donate leftover food, floral and greenery. Ask your vendors about their green policies, and support those who share your green objectives. Provide local, organic and vegetarian food and beverage options. Provide water in pitchers or bulk coolers. Ask exhibitors and contractors to reduce their waste – use less packaging (provide a storage area for re-usable packaging) – and to follow the recycling program. Ensure information is provided to them in their exhibitor pack and conduct an exhibitor briefing to provide further information. Create a ‘green’ booth for exhibitors – ask your supplier to design a more environmentally-friendly option. Promote the use of custom stands that can be reused at other events. Promote your environmental initiatives as a marketing tool. Use this as an opportunity to explain your initiatives and educate your delegates. Reduce printed material by using electronic communication wherever possible – eg, websites, email, electronic presentations, broadcasts, podcasts, online video, USBs, SMS etc. If printing is unavoidable, use recycled paper. Aim for at least 50% post consumer waste recycled paper and print double sided with vegetable inks. Ensure printed material is produced in a reasonable size and quantity and include a request to recycle after use. Consider SMS to provide confirmations, seating and registration details. Submit proposals and quotes electronically and limit handouts in meetings. If you need to print information as well, using recycled paper and an environmentally-friendly printing process can help reduce the environmental impact of your event. Look at environmentally-friendly options for delegate satchels – instead of plastic bags offer hemp or calico bags or something that can be used again. Avoid printing programs, delegate handbooks or collateral – provide this information online, via email, CD or even on a memory stick. 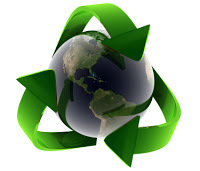 If you need to print, make sure you use recycled paper and that the printing process is also environmentally-friendly. Collect and reuse name badges if possible.